Tomlinson 1200 HIGH VOLUME CONDIMENT DISPENSER is a superb product designed to cater to high volume dispensing needs. 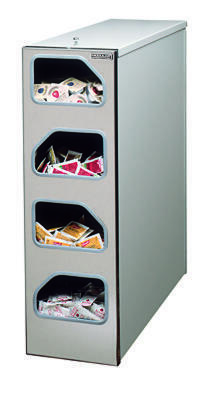 The dispenser comes with an astounding capacity to hold over 1500 condiment packets. Moreover, the top loading feature allows easy rotation. The made in USA dispenser is made of aluminum and has a gray color. The freestanding dispenser is lenient on space consumption and cleaning requirements as well as maintenance and proves to be a true value addition to your facility. Simple to use dispenser is offered in 24" x 26" x 8" size and meets all the essentials of smooth dispensing of condiments in high volume. Select Tomlinson foodservice solutions for the peace of mind out of performance you deserve.